It’s not common for Time to feature a chef on the cover so it’s probably a big deal. Rene Redzepi is the top chef in the world; his restaurant Noma has taken up where El Bulli has left-off. 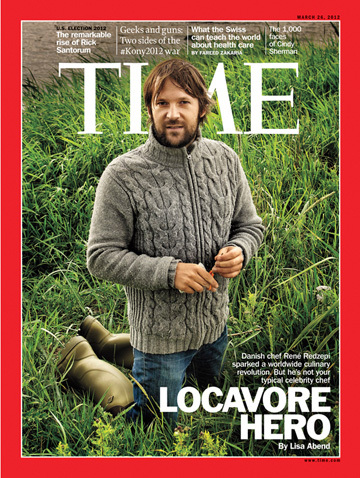 But with molecular gastronomy now seeming a bit passe, Redzepi pushes for locavore cuisine. It’s both hailed and criticized; yet it is a concept applicable for all cultures and cuisines. Literally involving foraging for indigenous ingredients. The article is honest and inspiring. A fascinating view of how this will change the culinary landscape. Time March 26 issue out now. Where in the World is Ambos Mundos? Do You Still Drink Yakult?